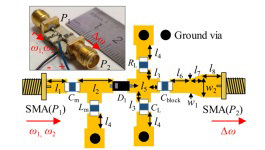 Researchers at the University of California, San Diego review key power amplifier requirements for millimeter-wave 5G systems and evaluate competing technologies’ output power, efficiency, linearity and material characteristics. 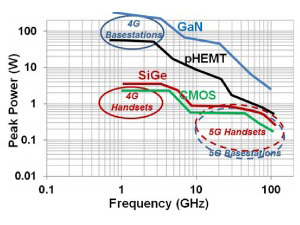 Alternatives tested include prototype 5G PAs, including CMOS-SOI, stacked FETs based on nMOS and pMOS for 28-GHz operation, and outphasing and Doherty amplifiers. The wireless-reality revolution will require a quantum leap forward in our ability to control and manipulate the RF-to-THz electromagnetic spectrum and to transmit, acquire, aggregate, and process the associated data. A new frequency multiplier directly generates fourth, sixth, and eighth harmonics of an input in a single stage. 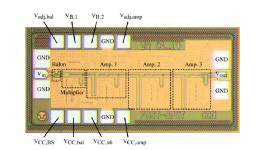 A prototype using a 37-GHz output-referred bandwidth from 173 to 210 GHz showed output power up to -6 dBm and 10 dB conversion gain, the highest in class reported to date. 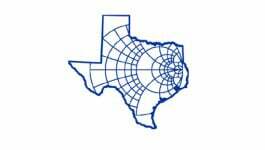 The 2019 IEEE Texas Symposium on Wireless and Microwave Circuits and Systems runs 28-29 March at the Baylor Research and Innovation Collaborative in Waco, TX. The Plenary Talk is “Multiband Filters and Cold-plasma Electronics for Reconfigurable 5G RF Front-ends” given by Prof. Dimitrios Peroulis (Purdue). Maybe the Fastest Switching Ultra-wideband Frequency Synthesizer in the Market! AnaPico’s APSYN140 is an ultra-wideband low phase-noise synthesizer, now settable from 0.01 to 43.5 GHz! Click for more info. In the latest software release, a 3D model of a multi-layer circuit can be built by importing DXF/DWG files through an automated routine. Multi-layer stack is defined with a technology file. Studies of terahertz wireless channels have so far been limited to atmospheric transmission bands below 350 GHz. 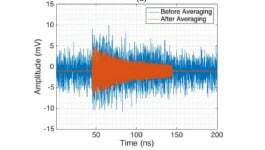 This research adds channel measurements for a 650 GHz carrier and compares 350 GHz performance in a typical indoor environment for line-of-sight and non-line-of-sight paths, showing delay spreads under 80 ps for both frequencies. 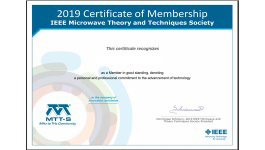 Members can download and print their MTT-S membership certificate from IEEE Collabratec. From the Collabratec home page, select your account (your initials and name in the tinted circle at the upper right), and choose “Member Certificates” to download a printable PDF. You might want to explore other Collabratec services while you’re there. Drawing on actual 3MT® experience, this webinar addresses the art of brief, effective live communication of complex technical material in language suited to a non-specialist audience. 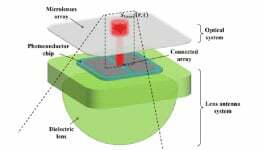 This pulsed photoconductive THz source can radiate mW-level average powers, over large bandwidths by exploiting optical and electrical properties of photoconductive sources and ultra-wideband properties of connected antenna arrays. A micro-lens array splits the laser beam into NxN spots that host the active excitation of antenna arrays. 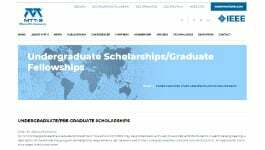 The IEEE MTT-S will sponsor up to ten undergraduate/pre-graduate scholarships in 2019. The awards consist of: a certificate of recognition; a USD $1500 USD scholarship; and a travel stipend up to USD $1000 to attend the IMS 2020 or a regional MTT-S conference. The next application deadline is 15 April. This device exploits the monotonic relationship between intermodulation power and misalignment between transmitting (external) and receiving (internal) wireless power transfer antennas in a two-tone system. Magnetic feedback helps align the internal antenna to reduce interference, increase efficiency, and avoid potential tissue damage as transmission powers increase. 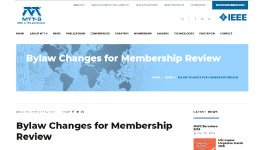 On 6 March, MTT.org posted several amendments to the MTT-S Bylaws approved at the January 2019 meeting of the MTT-S Administrative Committee and later by IEEE Technical Activities Volunteer Engagement and Governance. The changes go into effect within 30 days unless 10 percent of the Society members object to Mohammad Madihian. Researchers experimentally evaluated the speed limits of Terahertz rectification in field-effect transistors using the example of pulses from a free-electron laser. 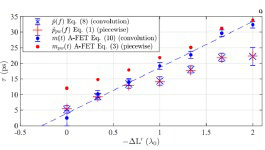 They developed an improved model for describing THz pulses and verified validity experimentally by comparison to spectroscopic data as well as to expectation values calculated from free-electron laser physics. Upcoming MTT-S-sponsored meetings include: Microwaves for Intelligent Mobility (ICMIM, Detroit, MI, 15-17 April); Electronics and Nanotechnology (ELNANO, Kyiv, Ukraine, 15-18 April); Siberion Conference on Control and Communications (SIBCON, Tomsk, Russia, 18-20 April), and more. Have Something to Share With MTT-S Colleagues? Members of the IEEE Microwave Theory and Techniques Society who want to share information about events, conferences, contests, publications, or other topics of interest to MTT-S colleagues are invited to e-mail Newsletter Working Group chair Roberto Gómez García (roberto.gomezg@uah.es) and newsletter editor Douglas McCormick (douglas.mccormick.us@ieee.org). Interested in other IEEE Newsletters? ©%%=Datepart(Now(),”year”)=%% IEEE – All rights reserved. Use of this Web site signifies your agreement to the terms and conditions.